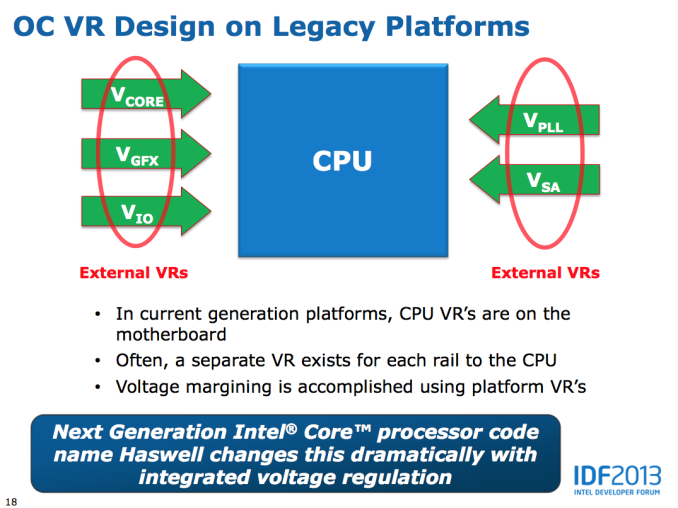 As we march towards the June 2nd release of Intel's Haswell processors, the company is slowly but surely filling in the missing blanks. Most recently we saw a shot of the often discussed but rarely seen Haswell GT3e part with on-package DRAM, and today we get some confirmation on what overclocking Haswell will be like. In the old days, both of the variables on the right hand side were unlocked (back then it wasn't called BCLK). Around the time of the Pentium II, Intel locked the multiplier ratios (rightmost variable) and then a few years ago we lost the ability to manipulate un-multiplied input frequency. We can actually trace the recent struggles with BCLK overclocking back to the days of Lynnfield in 2009. Lynnfield featured Intel's first on-die PCIe controller, which wasn't fully decoupled from the rest of the CPU. We still had BCLK overclocking, but you needed to supply higher core voltages to the CPU to get there with any amount of stability. Nehalem, Lynnfield's predecessor, didn't have this issue. With Sandy Bridge, we lost the ability to overclock using the BCLK altogether. Intel made good on this tradeoff by giving us a couple of K-series SKUs with unlocked multipliers, but it pretty much killed the market for buying low end Intel CPUs and overclocking them to deliver the performance of much higher end parts (sidenote: this is why we need AMD, ARM only pushes Intel to be more competitive on power at this point). Ivy Bridge didn't really change things, but Sandy Bridge E did restore a bit of BCLK overclocking. You could select from a handful of predefined straps that enabled BCLK overclocking but without running the PCIe or QPI busses out of spec. With Haswell, we get something similar. The default BCLK for Haswell parts will remain at 100MHz, however now you'll have the ability to select 125MHz or 167MHz as well. The higher BCLK points are selectable because they come with different dividers to keep PCIe and DMI frequencies in spec. At each of these BCLK settings (100/125/167MHz), the typical inflexbility from previous architectures remain. 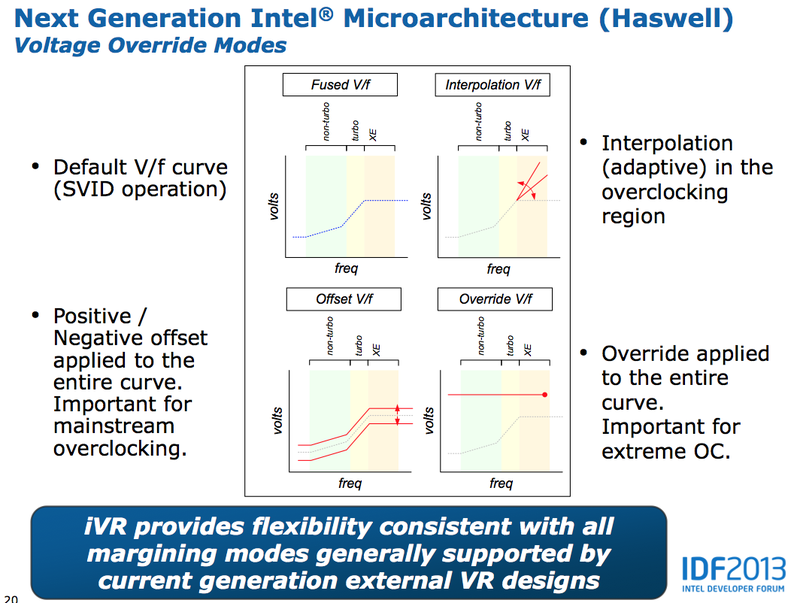 Intel's guidance is you'll only be able to adjust up/down by 5 - 7%. Obviously we'll still have K-series SKUs with fully unlocked multipliers. Intel claims the CPU cores will have ratios of up to 80 (8GHz max without BCLK overclocking, although you'll need exotic cooling to get there). Some parts will also have unlocked GPU ratios, with a maximum of 60 (GPU clock = BCLK/2 * ratio, so 3GHz max GPU clock). 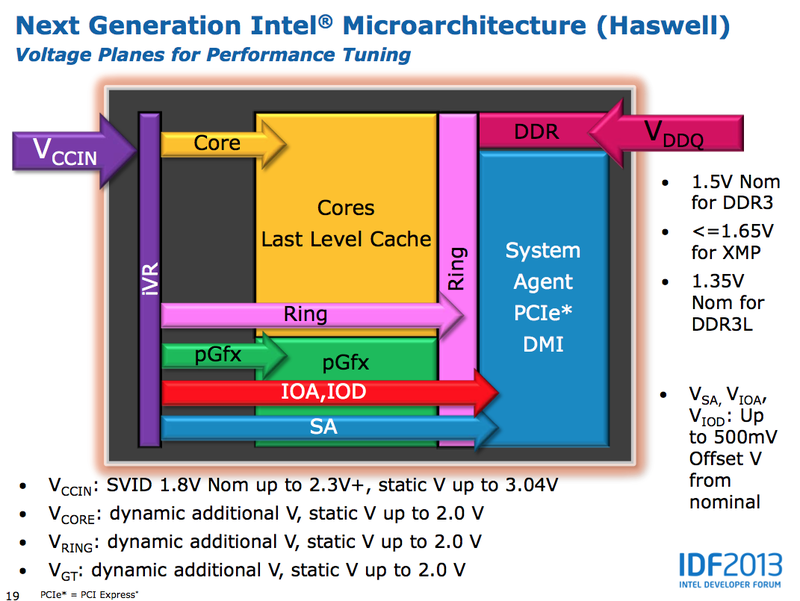 Memory overclocking is going to be very big with Haswell. Intel will offer support for 200MHz steps up to 2.6GHz and 266MHz steps up to 2.66GHz on memory frequency, with a maximum of 2.93GHz memory data rate supported. Voltages are the other big change with Haswell. 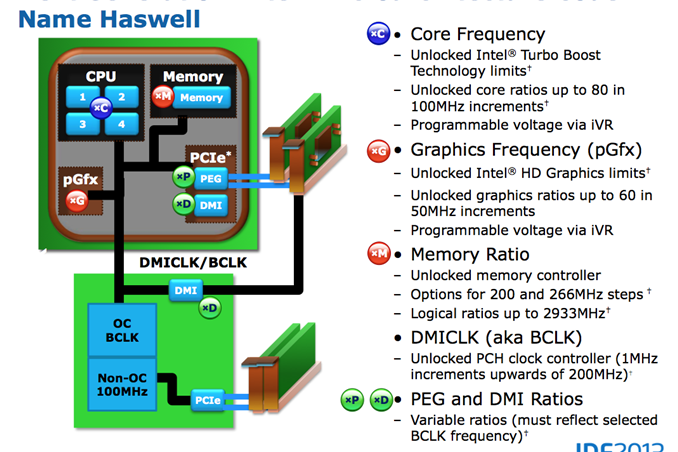 All Haswell SKUs will ship with an integrated voltage regulator. Instead of having multiple voltage rails driven by external voltage regulators enter the SoC, Haswell will accept two input voltages: Vccin for logic and Vddq for DRAM. Vccin should typically be somewhere in the 1.8V - 2.3V range, with a max of 3.04V. Vddq will depend on your DRAM type. The integrated voltage regulator will support all of the same adjustments than we're used to on current Ivy Bridge platforms. 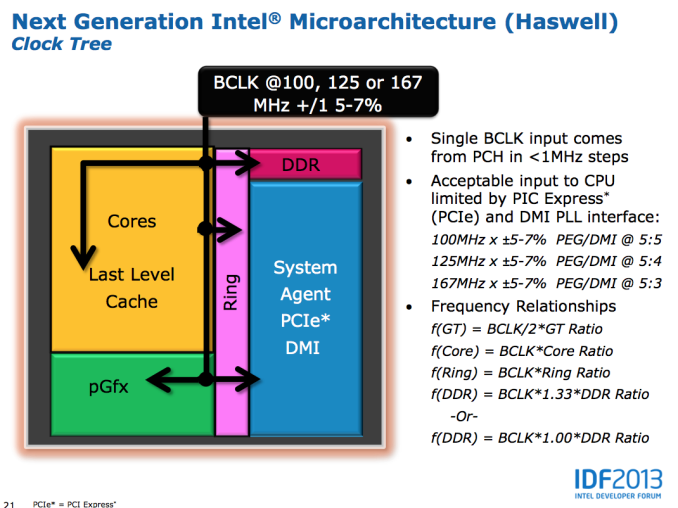 What Intel isn't talking about publicly is just how overclockable Haswell is. I'm hearing great things about LN2 overclocking, but other than the high-end memory vendors being pleased with the new platform I haven't heard much on what will be possible on air. A much beefier GPU (at least on the high-end SKUs) and on-package voltage regulation will make for some very interesting thermal conditions. Intel has been walking a fine line lately with giving the overclocking community enough to be relatively happy but not too much. The days of the Celeron 300A aren't coming back. Intel isn't a fan of giving things away for free and I wouldn't expect that to change now, especially given AMD's current competitive position. It's the chicken and the egg. People won't find a use for their integrated GPU until they start making it widely available and take seriously the idea of switching between the integrated GPU and the discrete, letting the two take different tasks. For example, imagine your discrete GPU focusing on the game's graphics and your Intel integrated GPU (that's already taking up space anyway) focusing on secondary tasks like physics or AI routines. Once the integrated GPU becomes an expected feature that everyone has, why shouldn't it be used instead of just sitting there like chopped liver? Right now, Intel seems intent upon mostly keeping everyone thinking like you. what is wrong with font? reading this with chrome 26 on 1440x900 resolution and the font looks (even what Im typing) that its written on typewriter that is almost out of ink. Font looks fine om my PC. Maybe something to do with Chrome? I'm using Firefox.